Perhaps the best ski resort in Pennsylvania, Blue Mountain is also one of the closest ski places to Philadelphia, a less than 90 minute drive up I-476. At 1,082, Blue Mountain boasts the highest vertical drop in Pa, and experts will enjoy two of the longest steeps in the state in Challenge and Razor’s Edge. There is a nice-size beginner area for kids, with a carpet and several small lifts, and two long winding green runs (Burma Road and Paradise) bracket the resort. There’s also some wide intermediate terrain and two parks—enough to entertain tricksters but not enough to overwhelm the mountain with park-happy boarders. Long mogul fields run along the side of the central Main Street trail; in the right conditions, these are mellow enough and soft enough to encourage casual bump fans. Conditions rarely warrant a trip into the glades, but there are a few entry options if the snow is right. There are two parking lots at Blue Mountain—one at the top of the hill and one at the bottom. A recently expanded base lodge and access to advanced terrain and two high-speed lifts makes the bottom lot the better choice. Blue Mountain PA trail map. The proximity to Philadelphia and impressive terrain means Blue Mountain PA can get overwhelmingly busy on a weekend. Smart skiers get there for the 8 AM opening and ski until lunch. The lines start getting oppressive about 11AM. Blue is also popular with racers. Unfortunately, this means one of the two long expert runs is inaccessible for most of the weekend days, increasing congestion. Founded in 1977 as Little Gap Ski Area (the resort sits on Kittatinny Ridge over the picturesque Little Gap Valley—yay views! ), it was renamed Blue Mountain in 1988, by which time it had expanded to almost its present size. The addition of a quad chair in the mid-1990s opened up more terrain, meaning skiers no longer relied on a slow double lift for the ride from base to ridge. This double was replaced with a high-speed sixpack in 2006, and the resort continues to see almost-annual improvements, including a new EZ-pass style ticketing system in 2013. 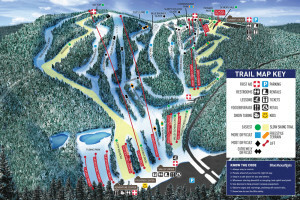 There are a range of ticketing options available, including a six-hour pass and a night-only pass (4-10PM) to take advantage of Blue Mountain’s full-mountain night skiing. Cheap Blue Mountain ski tickets are available at local ACME supermarkets, through booklet deals, and online. Blue Mountain also offers tubing and extensive summer activities. The opportunity to own slopeside property at our Vista Lodge is coming soon, located high a top Blue Mountain Resort! Copyright © 2019 Ski Resorts in PA. This guide to PA Ski Resorts is created by PennSKIvania.